Visitors entering the 2018 Carole Nash MCN London Motorcycle Show are set to be welcomed by nine of the most successful and influential Grand Prix machines ever built, including seven title-winning bikes. The unique display spans 38 years of GP racing, from Barry Sheene’s 1979 500cc Suzuki through to 2017 Champion Marc Marquez’s RC213V. World Superbike legend and former ‘I’m a Celebrity’ winner Carl Fogarty returns to the track in the exciting new Michelin Thunderdrome live action display. Alongside the very latest machines from the world’s leading manufacturers, the 2018 Carole Nash MCN London Motorcycle Show will be celebrating the very best of Grand Prix motorcycle racing. On display for the very first time will be the Michelin Grand Prix Icons Paddock, showcasing nine incredible machines, spanning 38 years of success. The oldest machine on display will be Barry Sheene’s 1979 Suzuki, which was part of the history-making British Grand Prix which saw Sheene go head-to-head with Kenny Roberts over 28 incredible laps. 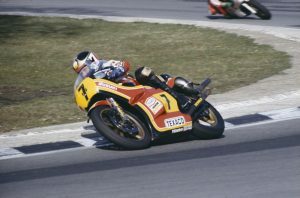 Alongside the Suzuki will be the first of seven World Championship winning machines, Freddie Spencer’s 1983 Honda RS500. Up next will be Wayne Rainey’s 1992 title-winning Marlboro Yamaha alongside the 1993 Champion successor – Kevin Shwantz’s Lucky Strike Suzuki. The Schwantz machine isn’t the only Suzuki Champion on display as Kenny Roberts Jr’s 2000 Movistar RGV500 is also heading to London. The first of the MotoGP era machines on display will be Valentino Rossi’s 2003 Honda RC211V alongside his 2004 Yamaha M1. Fans will also be able to see the maiden Ducati Desmosedici MotoGP machine of Loris Capirossi from 2003 whilst the 2017 Championship winning bike of Marc Marquez will be sure to be a showstopper. Race fans will find plenty of exotica elsewhere at the show, as well as seeing World Superbike legends Chris Walker, Neil Hodgson, Ruben Xaus and four-time Champion Carl Fogarty go head-to-head over the three days in the new Michelin Thunderdrome live action show. The free show is inspired by boardtrack racers of the 1900s and will see the four legends race around an oval which features 45 degree banking…ensuring high speeds and dramatic overtakes! Visitors to the show can upgrade their ticket to a Paddock Pass, and enjoy the spectacle from their own grandstand seat as well as meet the riders in a private meet and greet. Discounted Adult tickets are available now and cost £17, with Senior and Student tickets available for £15. Children 15 and under go free with a paying adult. Motorcycle parking is also free. Paddock Pass tickets cost £40. Transaction fees apply.